Victorian surveys of Biddenham reproduced on early Ordnance Survey maps in the 1880s show a number of ponds. The two largest still exist – the village pond, off Gold Lane behind the Manor Hospital, and the smaller Ramsmead pond in Church End. In 1700 Sir William Boteler and his wife Elizabeth created a carp pond to supply fish for the Biddenham Manor table. Over time the former manor carp pond became known as the village pond. The pond lies on the ancient causeway – the Coffin Path – leading from the village green to the church. 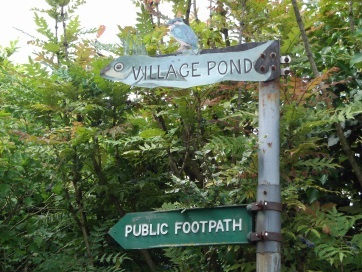 The way to the pond is directed by brown signs at both ends of the path and by a painted metal signpost between 3 and 5 Gold Lane in the form of a fish with a kingfisher perched on top. We don’t know when the pond ceased to serve its initial purpose of supplying fish to the Manor. At some point during the 20th century a boundary wall was breached to enable cattle in an adjacent field to use the pond as a watering hole; and the pond site was a favourite place for village children to explore and the pond a place to fish for tiddlers and to search for tadpoles and newts. Eventually it fell into disuse and became overgrown until in 1986 a group of Biddenham residents led by Dorothy Richards began a project to restore the pond and to maintain it as a nature conservation area and village amenity. Public access to the whole site was kindly granted by the two landowners. The Friends of the Biddenham Village Pond was established as successor to the project group to manage the pond site and its continuing conservation, and to raise the funds necessary to support that work. And the pond is proudly once more today one of the village’s cherished treasures. The Friends continues to encourage villagers and visitors to the pond to become members and to help financially through their membership subscriptions and practically with its regular conservation and maintenance activities at this special place (you can find a membership application form here to become a member). An information board was installed by the pond by the Friends in 2003, and was replaced by an updated and expanded board in 2013. Shortage of water was a serious problem in 1989, when the pond was topped up via a chain of irrigation pipes all the way from the river Great Ouse. On four subsequent dry occasions, the fire brigade stepped in to help. Most recently the pond dried up completely, for the first time in living memory, in 2011. The Friends pond management team decided that nature should be allowed to take its course as part of the transition to managing the pond as a “natural pond”, and almost inevitably once a drought order was imposed in early 2012 by Anglian Water, the rains returned and water returned to the pond. By the end of 2012, a very wet year, the pond was as full as anyone could remember. The wet and warmer weather conditions of 2012 unfortunately saw as well the large scale return of the pernicious weed azolla which, as in 2002 when the pond was also covered with its pink carpet, was removed manually. 2011 marked the Silver Jubilee of the pond restoration project. Over those 25 years, there had been big changes in the world and in the village. Biddenham had grown, villagers had come and gone, and the nature of activities in and around the pond had changed – lads and dads no longer came to fish: the pace of life had quickened with more and more calls on everyone’s time. In those changing circumstances, the Friends became a facilitator of environmental study and activities rather than an initiator. That change in emphasis was reflected in the Friends revised objectives adopted in 2012, which are to conserve the pond site as an attractive habitat for wildlife; to provide an area for quiet recreation for both Biddenham residents and visitors; and to provide an area available to educational and other organisations and to individuals for encouraging the study and preservation of the environment, particularly amongst the younger members of the community. In addition to the physical pond site itself, this website also provides an area but of a different sort through which we can pursue that third objective. The website was launched in 2013 and, together with the pond’s Facebook page, launched in 2014, makes information about the pond more widely and easily accessible to an extended audience. The pond features in the Biddenham Heritage Trail opened in April 2015 and on the new village sign unveiled in November 2015, confirmation of the pond’s significance as an important part of Biddenham’s heritage. 2016 saw the pond project’s 30th anniversary which was marked with a series of special events and the Biddenham Show chose the village pond as its theme for the year. An Extract from the Spring 2016 edition of Splash, the pond newsletter published twice a year, recounts some of the events from the first 30 years of the project, and the Autumn Autumn 2016 review of activities reports on the events during the anniversary year. In November 2016, the pond was officially included by Bedford Borough Council in an extension to the Biddenham Conservation Area. The pond has received grants and donations over the years from national and local organisations, including Bedford Borough Council, Biddenham Parish Council, the Biddenham Show Committee and the First Friday Lunch Club to help with projects, maintenance and repair work, and the acquisition and replacement of equipment. There are photos of the pond and its surrounds, and Friends’ events and activities in the gallery. And you can find out more about the ecology and management of the pond.